A 20-day-old, ex-full-term male was transferred to our institution for the management of group B streptococcal (GBS) bacteremia and central nervous system (CNS) involvement. In the emergency department, the newborn was lethargic, febrile to 102˚F, and had bulging fontanelles. Cerebrospinal fluid (CSF) analysis confirmed gram-positive cocci, low glucose, and elevated protein. Antibiotics were initiated. Within 24 hours of admission, an episode of apnea prompted emergent intubation. Postintubation, the newborn suffered clonic seizures of the left upper extremity. 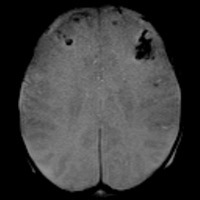 After urgent neurosurgical intervention and management with antiepileptics, the long-term prognosis was uncertain but likely included cortical blindness. 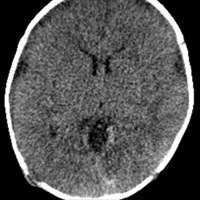 Nonenhanced CT demonstrated diffuse sulcal effacement, loss of cortico-medullary differentiation, and small bifrontal extra-axial collections (Figures A and B). 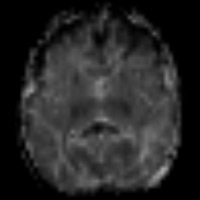 T1-weighted imaging revealed the presence of bifrontal cortical and subcortical white matter hyperintensity (Figure C). The gradient-recalled echo images prominently displayed areas of blooming artifact (Figure D). 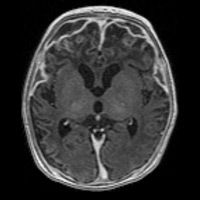 Abnormal restricted diffusion was seen in a predominantly cortical distribution, affecting both hemispheres (Figures E and F). T2-weighted imaging (T2WI) (Figure G) and contrast-enhanced T1-weighted imaging (T1WI) (Figure H) showed areas of profound cortical and white matter hyperintensity, ventriculomegaly, and rim-enhancing subdural fluid collections. With suspected CNS involvement, the radiologist will invariably be consulted. Acutely, newborns may develop meningitis, cerebritis, vasculitis, extra-axial collections, and infarction. Ultrasound, as a first-line modality for infants, may demonstrate a nonspecific increase in parenchymal and sulcal echogenicity; dilated ventricles may be a more evident finding. Nonenhanced CT may confirm hydrocephalus and reveal hypoattenuation within white matter and/or deep gray nuclei. 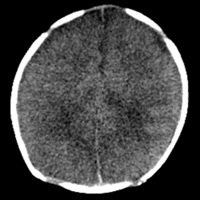 Subdural collections may represent reactive effusions or empyema. Multifocal hemorrhagic (venous) infarctions may be readily apparent. Simple screening protocols are essential and failure to adhere to guidelines can be deadly. In our case, chart review uncovered a GBS-positive mother, inadequately treated, prior to normal spontaneous vaginal delivery. — Rahul V. Pawar, MD, is a board-certified diagnostic radiologist completing a fellowship in neuroradiology at New York University Langone Medical Center. — David H. Harter, MD, is an assistant professor of neurosurgery at New York University Langone Medical Center/NYU School of Medicine. Figures A and B — Nonenhanced CT demonstrates diffuse sulcal effacement, loss of cortico-medullary differentiation, and small bifrontal extra-axial collections. Figure C — T1-weighted imaging reveals the presence of bifrontal cortical and subcortical white matter hyperintensity. Figure D — The gradient recalled echo images prominently display areas of blooming artifact. 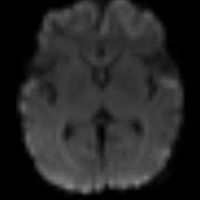 Figures E and F — Abnormal restricted diffusion is seen in a predominantly cortical distribution, affecting both hemispheres. Figure G — T2-weighted imaging shows areas of profound cortical and white matter hyperintensity, ventriculomegaly, and rim-enhancing subdural fluid collections. Figure H — Contrast-enhanced T1-weighted imaging shows areas of profound cortical and white matter hyperintensity, ventriculomegaly, and rim-enhancing subdural fluid collections. Centers for Disease Control and Prevention. Trends in perinatal group B streptococcal disease—United States, 2000-2006. MMWR Morb Mortal Wkly Rep. 2009;58(5):109-112. .Hamada S, Vearncombe M, McGeer A, Shah PS. Neonatal group B streptococcal disease: Incidence, presentation, and mortality. J Matern Fetal Neonatal Med. 2008;21(1):53-57. Infections of the nervous system. In: Barkovich AJ (ed). 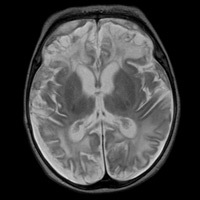 Pediatric Neuroimaging. Philadelphia: Lippincott Williams & Wilkins; 2000: 715-770. Hernandez MI, Sandoval CC, Tapia JL, et al. 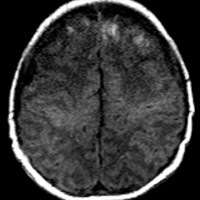 Stroke patterns in neonatal group B streptococcal meningitis. Pediatr Neurol. 2011;44(4):282-288. Singhi P, Bansal A, Geeta P, Singhi S. Predictors of long term neurological outcome in bacterial meningitis. Indian J Pediatr. 2007;74(4):369-374.